I’m all for going for low hanging fruit. I mean, it’s low isn’t it? Easy to reach. Minimal effort. Sometimes, though, it’s so low that you have to bend over to reach it. Stoop, even. One might say that fruit of that kind is “beneath” them. Me. Nothing’s too low. Not if it’s there for the taking. Stoop? Son, don’t even get me started. I will get down on my belly if it means reaching something juicy. I won’t let anything be beneath me so long as it’s easy. With that in mind, can I just say that I’ve seen more dong today than I’ve ever seen in my entire life. In fact, I’ve handled more dong in one day than I did all week long at 5th-grade summer camp. Today, I fondled dong. I played with dong in my pocket. I stared at other people’s dong. They yearned for mine. People gave me their dong and I took it with a smile. Sometimes we’d get the timing right and we’d be holding the same dong at the same time. Neither one of us paid it any mind there was so much dong between us. Sometimes dong confused me. I’d have so much in front of me I’d start getting nervous. Was I giving and taking the right dong? Do you take the dong or wait till it’s given to you? Was that his dong or mine? And you know what, size matters. The longer the dong the more it gets you. If you gave me a choice between you giving me short dong or long dong, I’d take your long dong every time. I’m serious. You would too. Don’t let anyone tell you otherwise. If you can’t tell, I’m in Vietnam. I’m also a juvenile (obviously). Oh, and dong is the local currency. So they tell me. I call it easy pickin’s. Best of all, it’s true about the size thing. The bills get longer the more they’re worth. I can’t wait to see my first million-dong bill. It’s gonna be like 10 inches long, real, and spec-tacular. To get here, I hopped a Phnom Penh to Ho Chi Minh bus at 6:30 a.m. with a bunch of Cambodians and a few foreigners. We hit the border at 11 a.m. There, a guy on the bus collected all our passports to “get stamp.” While he carted off a pile of our travel documents, we waited at a rest stop. In Cambodia, the calculation for Cambodian riel to U.S. dollars was easy enough: roughly 4000 riel for one dollar. It also helped that Cambodia uses the U.S. dollar as currency. It was odd to receive five or one dollar bills as change, but it did simplify my mental budget. Vietnam is a different story. The exchange rate is about 18,900 dong per dollar. That’s a lot of dong. It’s also not a very round number of dong. When I exchanged some dollars at the rest stop I had to borrow the lady’s calculator to make sure I was getting the correct amount of money. I stared at the currency and counted the zeroes to make sure that I got 100,000 dong bills and not 10,000. It’s higher math. Back on the bus I practiced: 100,000 dong = $5.25? 80,000 dong = $4.20? This was going to be tough. Unfortunately, the bus ride didn’t last long so I didn’t get much practice. 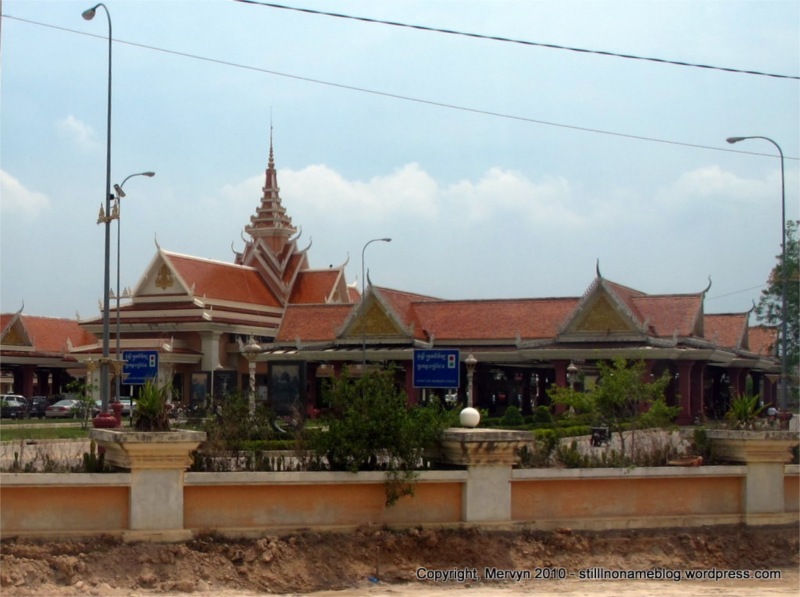 Our bus basically crossed the road near the rest stop and kicked us out to do Cambodian immigration. This meant piling out of the bus and waiting. The bus guy called out a couple of people, me included, to get our passports and get stamped out of Cambodia. Then we were called one-by-one to board the bus where we again surrendered our passports to the bus guy. 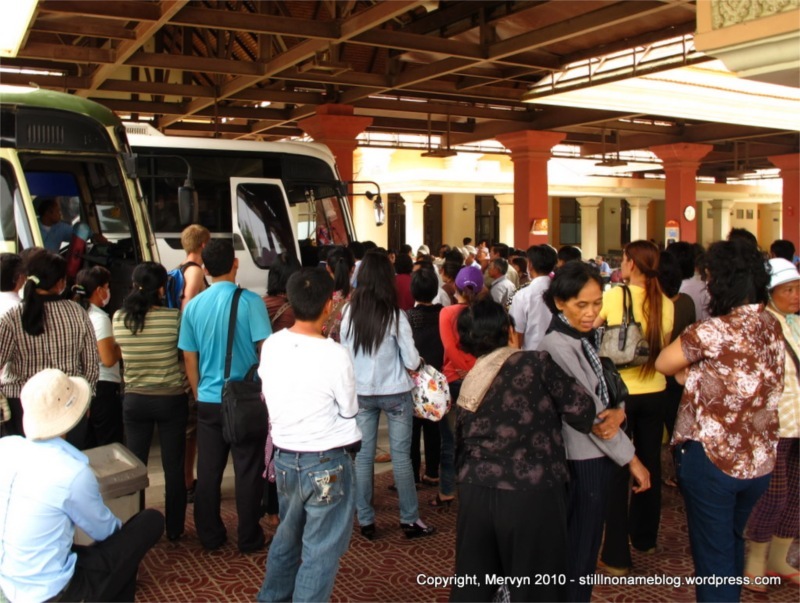 We drove a few hundred meters, then got back off the bus to wait in line at the Vietnamese immigration building. Nobody had a passport. Our helpful bus guy had them, I think. I joked about this with a Chilean guy. “I won’t worry unless you’re all across and I’m still here alone,“ I said. The immigration officer at the little booth worked his way through stacks of passports. Every once in a while an official would call out people’s names and countries. Those lucky people would elbow their way past the waiting crowd, grab their passport, and officially be in Vietnam. It’s like the Vietnamese authorities didn’t really care if we were the people on our passports. They were just trying to work their way through paperwork. We waited under the watch of heat sensors that were seemingly there to weed out the sick and infirm. I was one of the first Westerner’s on our bus to make it through. I grabbed my passport, waited in one more line to show a guard that I had a proper visa, then I was through. I hopped back on the bus where I waited. And waited. Turns out Ho Chi Minh City is only a bit over an hour from the Cambodian border. Of the 6 hour plus journey from Phnom Penh to Ho Chi Minh, two hours of it was working our way through immigration. The bureaucracy lives strong. A few first impressions of Vietnam. It seems cleaner than Cambodia. There appears to be less garbage on the side of the roads. The river I saw seemed trash free. Who knows if this is representative. The dress is a tad different. The women on motorbikes seem to be even more covered up than usual. They’ve got long fitted sleeves, gloves, and face masks. Some even wore those wide, flat, pointy rice paddy hats that you see in pictures. 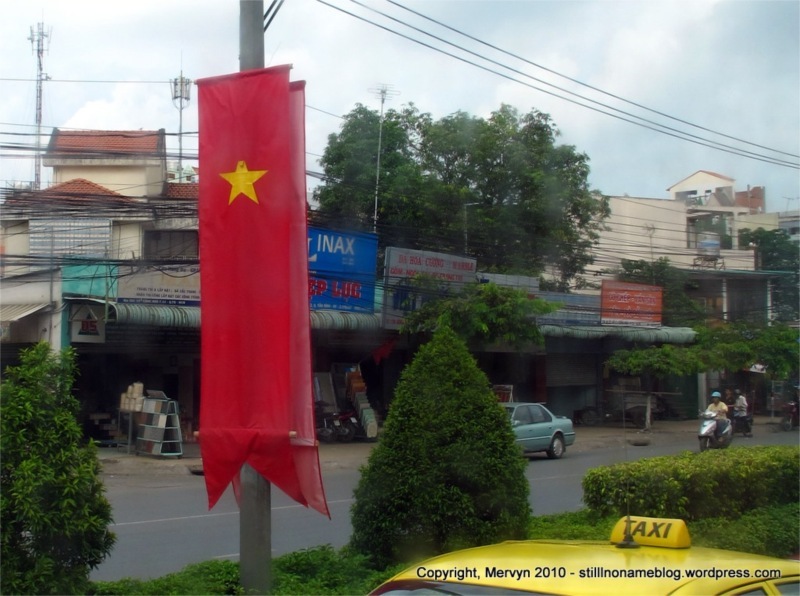 There are also Vietnam flags everywhere. If I didn’t know better, I’d guess that it was their independence day. If it’s not, this is a hell of a nationalistic country. 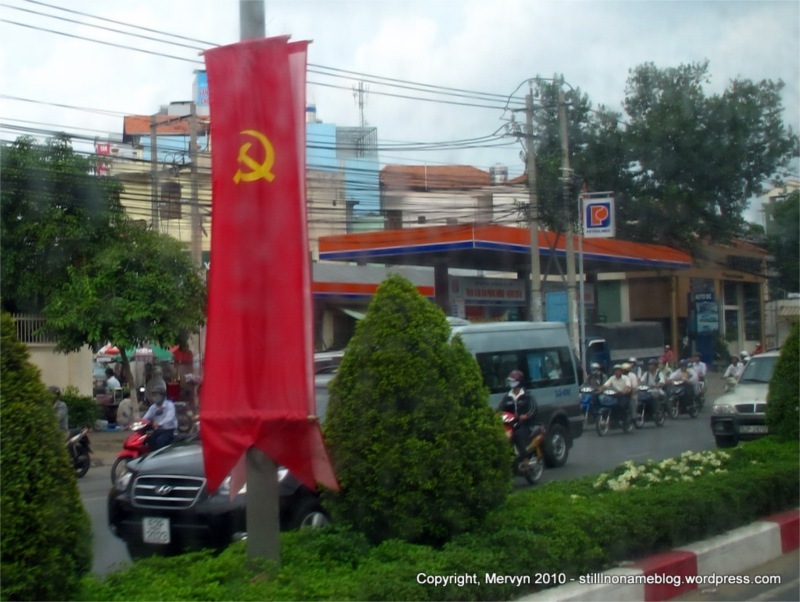 While the red flag with yellow star is not a surprise, what is is the plentiful banners with the hammer and sickle, yellow on a red background. There seem to be as many of those as Vietnam flags. I’m going to guess that I’m in a communist country. I decided to stay at the first place I visited, the Ha Vy Hotel. Ten bucks a night for a room with a desk, fan, fridge, hot water shower, sink, flush toilet, and tub. On my journey none of these amenities has been a given. I’m living in luxury, baby. I crashed for the afternoon, having spent the previous night waiting for a Laker game in vain. When I came to, it was dark. I ventured out into the street. Lots of neon and motorbikes. And lots of people. I seem to be in a tourist part of town so there were a lot of pizza joints and other Western fare. All more expensive than I wanted. All a little too familiar. There were a lot of locals about, so I knew there must be a place for Vietnamese. I hunted for a bit and found a fluorescent lit restaurant where everyone was native. No menu, of course. Just a lady behind a metal cooking stove surrounded by ingredients. A guy asked if I wanted soup. I said, “Yes, beef ball.” He walked away, so I guess that meant something to him. Sure enough, I got a bowl of pho with compressed meats of various shapes and colors. I was starving and wolfed it down, occasionally pausing to toss in mint leaves and bean sprouts. It was good. Very good. I sipped on a 7UP and munched happily. When I got up to pay, the guy asked for 40,000 dong. I think I yelped. I couldn’t remember what the exchange rate was and I was trying to do math while pulling out my cash. “How much?” I asked, trying to figure out if I was getting ripped off. 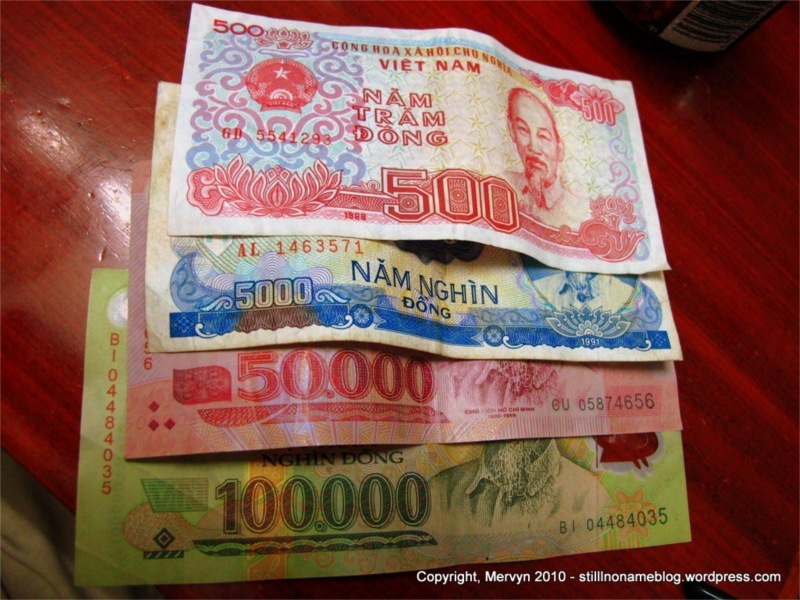 While I fumbled with the cash, he pulled a 100,000 note from my hand and gave me back 60,000. That’s when my brain came to. He just asked me for about two bucks. He wasn’t trying to rip me off. He was being straight–helpful even. I’m just slow. The amounts still blow my mind. I think they should drop a couple zeros. Make life easier for us non-number people. It’d keep me from embarrassing myself while fumbling with my dong in front of others. I’m not ashamed to say, I cracked myself.